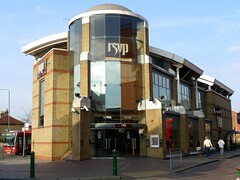 A bar in Bexleyheath, formerly a Yates's. It has a modern, fairly pleasant ambience during the day (not visited in the evening). There is no real ale, but a good selection of lager. Food is served during the day and early evening (until 9pm). Karaoke is held on Wednesday evening. Last visited by gellyfish, some time in 2007. Last edited 2013-05-10 07:52:21 (version 7; diff). List all versions. Page last edited 2013-05-10 07:52:21 (version 7).